LAWRENCE — It’s commonplace in U.S. coastal areas and floodplains to upraise homes in order to keep living areas dry in case the water rises. However, mobile and wood homes standing a few feet off the ground could be a lot more susceptible to winds exerting force from underneath and increasing the force of loads on walls and ceilings — a possibility that has been studied little, until now. 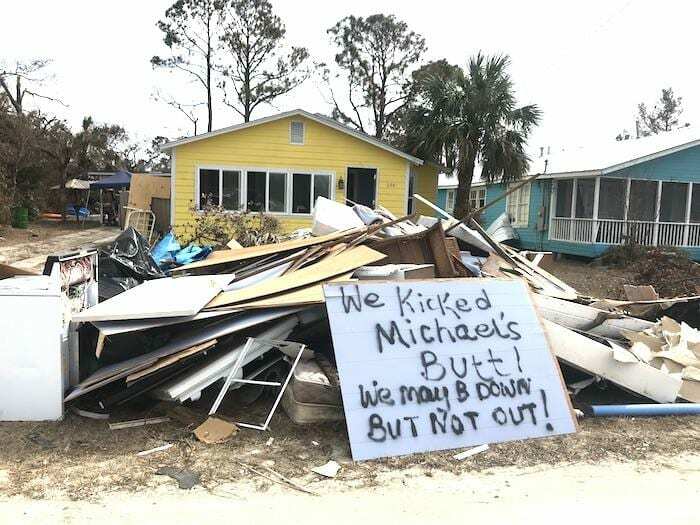 Today, a researcher from the University of Kansas is investigating elevated residential buildings in the aftermath of Hurricane Michael’s impact of the Florida panhandle, where recorded wind speeds reached and exceeded design wind loads along the coast. Elaina Sutley, assistant professor of civil, environmental & architectural engineering at KU, is performing the work with a new $45,000 RAPID grant from the National Science Foundation. Sutley said elevated residential buildings are governed by a patchwork of building codes, including ASCE 7, the American Society of Civil Engineers’ minimum design loads for buildings. Based on ongoing experimental work, Sutley and her team identified wind damage could be greater to permanently fixed housing elevated between 3 and 7 feet compared with housing elevated less than 3 and greater than 7 feet. To perform an assessment, only a few days after the wind stopped blowing, the KU researcher and her team arrived in the Florida panhandle. According to Sutley, undertaking research in a disaster zone where so many people recently had lost their homes wasn’t easy. Sutley and her colleagues surveyed damaged housing, making photographs and recording data on their smartphones. The team wanted to record damage to structural and nonstructural components, which often begins with gutter systems, roof-and-wall-sheathing nailing and skirting, which could fatigue and fail under hurricane loads, then cascade into catastrophic failure through vulnerabilities created in the wall and roof systems by these fatigue failures. This field data will be used to validate experimental and analytical research Sutley and her team are performing to advance the state of knowledge on structural behavior, wind pressures, and component behavior and failure modes for elevated site-built and manufactured housing. The collected data will be analyzed and categorized for damage levels, then mapped with wind-speed and surge height to grasp effects of wind speed and direction on damage for the types and elevations of buildings considered. Further, images and survey data will be stored on DesignSafe-CI, then made available to the broader research and engineering community. Sutley hoped the research could help inform standards, especially in vulnerable areas. Lastly, Sutley suggested residents of mobile homes would do well to safeguard their properties with a few safety measures that are believed to make a difference in high winds.